^ Borger, Julian (21 Aug 2013). "NSA files: why the Guardian in London destroyed hard drives of leaked files". The Guardian. Retrieved 27 May 2018. ^ Alvarez, David (2001). "Most Helpful and Cooperative: GC&CS and the Development of American Diplomatic Cryptanalysis, 1941–1942". In Smith, Michael; Erskine, Ralph. Action This Day: Bletchley Park from the Breaking of the Enigma Code to the Birth of the Modern Computer. Bantam Press. ISBN 978-0593049105. ^ "GCHQ (@gchq) • Instagram photos and videos". www.instagram.com. Retrieved 2018-11-01. ^ Weaver, Matthew (2018-10-31). "GCHQ uses Instagram to 'open up world of espionage' to public". the Guardian. Retrieved 2018-11-01. ^ a b c d e f g h i "Operational Selection Policy OSP8" (PDF). Retrieved 2018-01-24. ^ "Life at GCHQ | GCHQ". 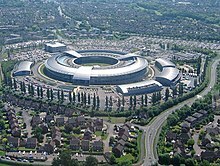 www.gchq-careers.co.uk. Retrieved 2019-04-05. Smith, Michael (2001). "GC&CS and the First Cold War". In Smith, Michael; Erskine, Ralph. Action This Day: Bletchley Park from the Breaking of the Enigma Code to the Birth of the Modern Computer. Bantam Press. ISBN 978-0593049105.